I love kheers, but when it comes to Rabdi, I avoid, in fact everyone in the family avoids. It is delicious and I cheat the family by freezing the Rabdi and converting it into a Kulfi. I made this for a dinner and my guests were so happy that they wanted second serving too. The sweetened khoya is the thickening agent in it , along with it , it gives a absolutely delicious flavor. The rose water in it is heavenly and the roasted almonds give it a crunch and a lingering taste. The saffron is sprinkled so you get that flavor too, in all a hit Indian party dessert. You could serve it chilled or freeze it to turn them into kulfis, the choice is yours, I assure you there will be no ice crystals in the Kulfi. The kids will love it too. 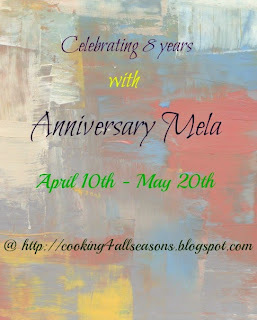 This is my Day 1 post under Srivalli's Kid's Delight , with the theme creamy foods hosted by Mireille. Boil the milk, till reduced to half. Add nuts and give one or two boils. Add the khoya and cook for a few minutes. The consistency should be quite thick. Add sugar if required . Sprinkle nuts and cardamom powder.